Winter is coming, which means: cold, rain and maybe even snow might be coming our way. It is very important to protect your trampoline in the winter period. But how can your trampoline be best prepared during this season? We will give you a few tips! The first step is cleaning your trampoline. You can start off by removing the dirt on your trampoline; this can be anything from autumn leaves to snow. Secondly, you can clean the trampoline with (cold) water and a cloth. Please be aware that you do not use any other cleaning products like soap, as these might damage the material! Immediately dry off the trampoline after the cleaning process, to make sure no water remains. By regularly maintaining your BERG, the quality remains the same and the lifetime could be improved. Additionally, you can protect your trampoline with a weather cover; this helps protecting it against rain, leaves or other dirt. The weather cover covers the protective edge, springs and jump mat of your BERG. Therefore, it protects more parts of the trampoline than just the jump mat. The BERG weather covers are available in different sizes and colors. It is also possible to secure your trampoline during heavy weather conditions. This can be done by using an anchor set. This ensures that your trampoline keeps standing during a storm. Sometimes an anchor set is also not resistant against storm. It depends on where your trampoline is placed. If it is in an open area, the jumping mat will catch a lot of wind and the anchoring set can be completely untied. The chance that this happens is small. The ground where the pin is turned is also important for the handhold. Sandy soil is less firm than for example clay soil. If you have enough space to store your trampoline, you could consider to disassemble your trampoline in the winter time. By storing it away in for example a shed or garage, your trampoline will definitely not be damaged during this cold season. 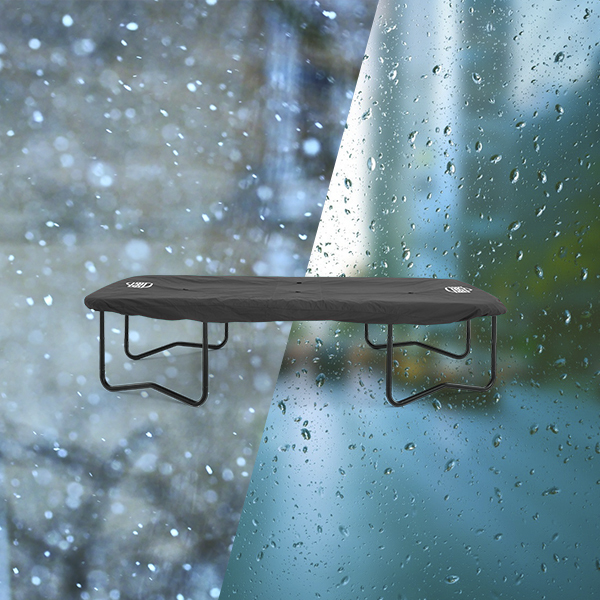 With these tips & tricks your trampoline should get through the winter period without damages! BERG is always looking for ways to make outdoor playing as accessible as possible for everyone. Meaning we offer four different frames for our Large Ride-ons (aged 5 years and older), for both children and adults. 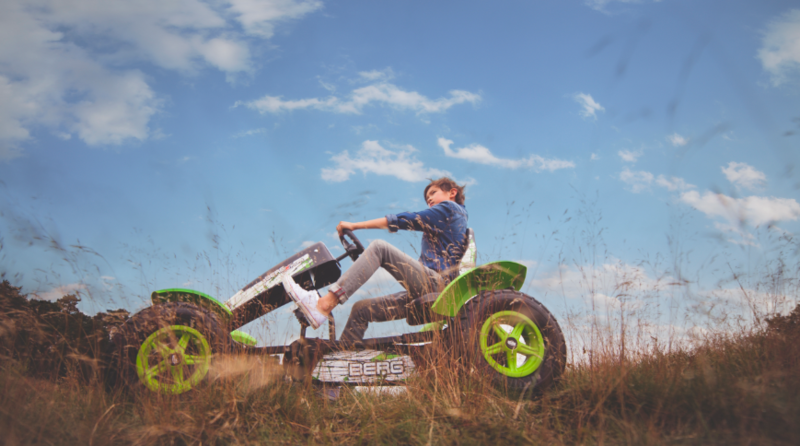 There is a suitable frame for everyone, so it really depends what exactly you are looking for in a pedal go-kart! In this blogpost we will explain the differences between the four frames and in which circumstances each frame has its own unique qualities and specifications. This way, you can always make a good choice. All large BERG Pedal go-karts have a BFR-system. BFR stands for: Brake, Freewheel and Reverse. This system allows you to brake with the pedals, but also immediately drive backwards after coming to a standstill. Additionally, the freewheel ensures that the pedals remain stationary whilst the wheels are still turning. The combination of these techniques makes sure you can always safely drive around on your BERG Pedal go-kart. Besides the BFR Frame, BERG also offers a BFR-3 Frame. The abbreviation of BFR remains the same, but with only now you get something extra: three gears! Three gears on your pedal go-kart ensure optimal comfort and makes sure you get to your destination even quicker. These gears especially come in handy when you for example have to climb a hill. Simply said: the BFR-3 Frame gives you an extra opportunity to win a race! Who says riding a pedal go-kart is only for children? Thanks to the BERG XXL-Frame, riding around on a go-kart can be even more fun for taller people. The BFR Frame and XXL-Frame have a lot in common and both have the BFR-system. The big difference between the two, is that the seat on the XXL-Frame is adjustable in eight different positions, instead of six. This makes sure tall people can also join a pedal go-kart race! Another extra is that the XXL version has an extra sturdy frame, making it even stronger than the XL-Frame on our BFR Pedal go-karts. The E-BFR Frame is BERG’s newest frame, suitable for everyone aged 6 years and older. All pedal go-karts with this frame are our BERG E-go-karts, meaning they have electric pedal assistance up to 16 kilometers per hour! The E-BFR Frame can be put on several of our pedal go-karts, making sure there’s a go-kart for everyone. When you have a pedal go-kart with an E-BFR Frame, the BFR Frame and XXL-Frame are automatically integrated within this frame. The E-BFR Frame also makes sure you can brake with the pedals and immediately drive backwards after coming to a standstill. Besides that, the seat can be adjusted in eight positions, meaning years of fun! Which frame suits you best? 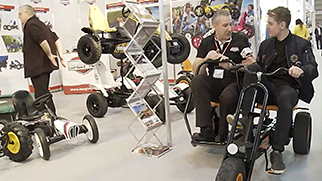 Here you can find an overview of all our pedal go-karts. The Baby Innovation Award Kind + Jugend 2018 goes to: the BERG GO²! After winning the first award for our youngest design, the BERG GO², the second award is also a fact! The pedal go-kart won the Baby Innovation Award Kind + Jugend 2018 in the category “World of Kids Toys”. After many submissions from different countries, the jury of experts announced the nominees per category. 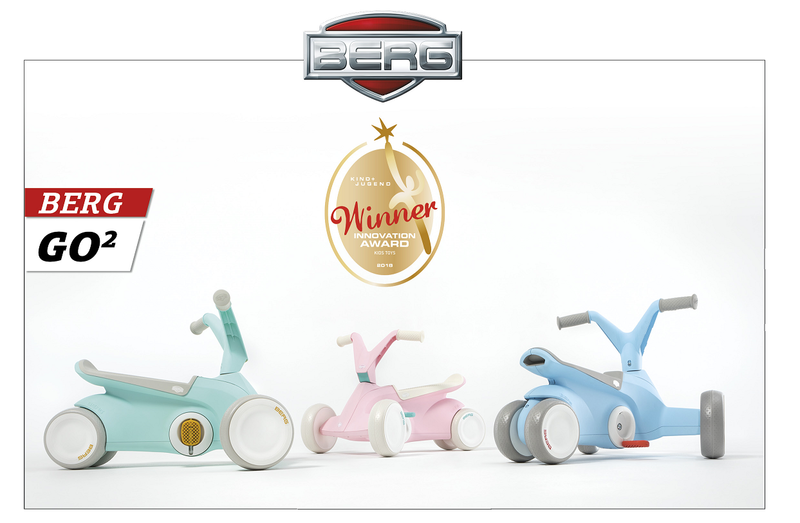 We are very proud to announce that the BERG GO² is the category winner! The winners of the Baby Innovation Award are distinguished in the market based on: design, appearance, materials, use and technology. Besides that, every product needs to have a unique and practical benefit for the consumer. The most important requirements that the jury of experts assessed are innovativeness and safety. We are honored of winning the Baby Innovation Award Kind + Jugend 2018 and grateful that the unique advantages of the BERG GO² have been recognized by the jury of experts. Did you know that jumping on a trampoline has a positive effect on your health? It is a perfect tool for your daily work-out, where you can determine the intensity yourself. Besides the health benefits, it ensures endless fun! The trampoline can be used by anyone and it is a healthy and fun way to exercise more. Besides that, a trampoline can make you happier; it is proven that jumping decreases stress levels. By bouncing, you get more oxygen in your blood, improving the blood circulation. This has two advantages: your lungs and skin are both purified, plus you experience a more relaxed feeling. In addition, according to a study by NASA (National Aeronautics and Space Administration), jumping on a trampoline has major positive effects on your body. When your body gently hits the springs, you can train your whole body. At the same time, no major pressure is exerted on your muscles, bones or tendons. It results into less sensitivity for injuries, thanks to extra-long and smooth springs like our TwinSpring technique. According to NASA, jumping on a trampoline is even 68% more effective than jogging. It makes you stronger and fitter; helping certain physical complaints to be solved. Also, the rapid burning of calories is a nice way to help when slimming. It is also used as a ‘class’ in the gym. 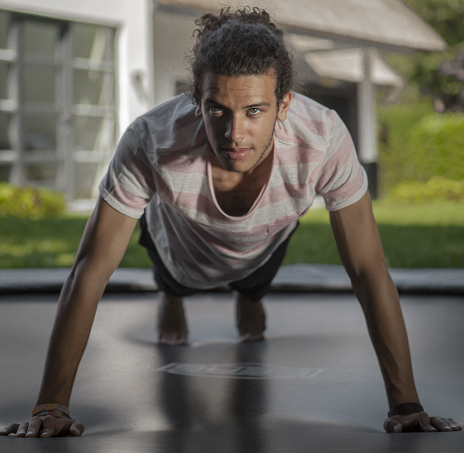 The biggest advantage of a trampoline is that it can be placed at home and you can create the same effect. This also saves you the time when travelling to the gym. Jumping on a trampoline therefore has several effects on your health and a positive effect on your body. A while ago, the review site of pricerunner.com tested some of our trampolines and awarded us with two winner badges. Our BERG Favorit received the badge ‘Best Trampoline’ and our BERG Champion received ‘Best Premium Choice’. In this blogpost we would like to tell you a little bit more about what these badges mean and how Pricerunner puts their products to the test. Pricerunner is also known for their ‘Best in test’ winners badges, is a company testing products their selves in real everyday conditions. They are able to see if a product is of good quality and for example if a product is worth the ‘hype’. They test products over a long period of time to give a reasonable advice to the product and what you should or shouldn’t do. This adds up to a reliable image of certain products, tested by experts within various areas. 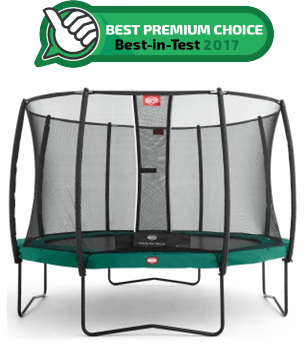 For the trampoline test, the company first gave some clear examples on why it’s better on the long-term to go for a better quality, but higher priced trampoline. This is something we really want to bring across to our costumers as well, since the high quality is better for the trampoline’s durability and there’s a reduction in the need for spare parts. After the Favorit trampoline, the BERG Champion was put up to the test. 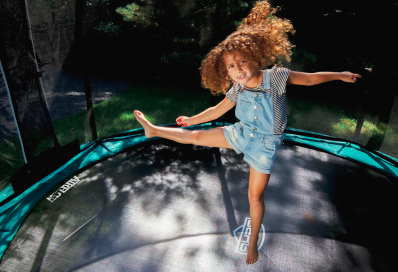 This trampoline offers even better jumping comfort thanks to their TwinSpring Gold springs. Pricerunner tested our BERG Champion and it was awarded with a ‘Best Premium Choice’ badge. We are very proud of receiving a winner badge for this trampoline as well! 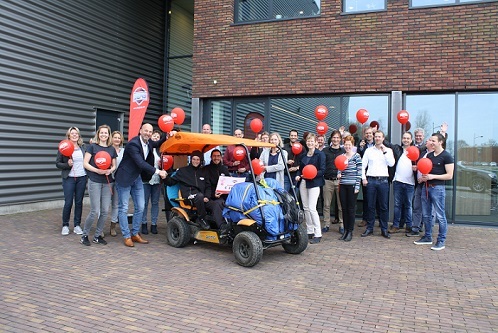 Red Dot Award for the BERG GO²! The Red Dot Award: Product Design 2018 goes to: the BERG GO²! The Red Dot Design Award is a yearly organized, international design competition. A ‘Red Dot’ is one of the most wanted quality marks for excellent designs. 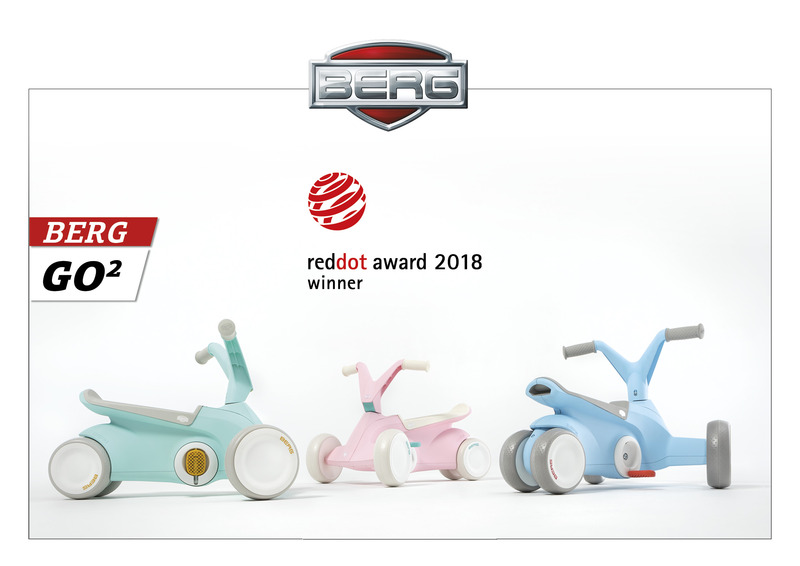 Winning a Red Dot is a great honor and we are pleased to announce that BERG won the Red Dot Award: Product Design 2018 for our youngest and most innovative design: the BERG GO². The Red Dot Award: Product Design dates back to 1955, consisting of 48 categories where products can be entered annually. Many manufacturers and designers hand in their best products; all assessed individually by experts. Due to the large number of participants, we are very proud of winning a Red Dot. We are very thankful that the high quality and innovative design of the BERG GO² has been acknowledged by the jury of experts. Our BERG partner in France, www.best-toys-ever.fr has come in contact with two young men: Loïc Lemoine and Christophe Jacq. They came up with the fantastic idea of cycling from Brest in France to Peking in China on one of our BERG E-GranTour family bikes. We will certainly be following them on this trip. They have already appeared in several newspapers and have also been on TV. Because they will meet many people on the way, we believe it is important that everyone knows who they are, what they do and why they are doing it. Initiatives like that are always fantastic. See this article in one of the many local newspapers they have appeared in. 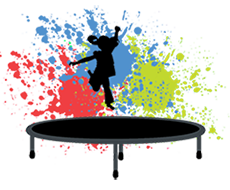 Do you love trampolining and do you want to learn how to jump even better, higher and safer? These two Dutch trampoline champions will show you how it’s done! Naturally, we will start with a warm-up. This will warm up your muscles and reduce the risk of injury, so do not skip the warm-up! There are various ways to land safely after a jump. It is very important that you do not hold your arms behind you but in front of your body. Do you want to land on your stomach? In that case, do not keep your arms straight but bend them at the elbows to avoid any accidents! The Tuck, Straddle, Seat drops and the Half twist are examples of jumps that you can make. Hopefully, it will give you inspiration to also make such beautiful and great jumps!